"tamso ma jyotirgamayam", meaning "from darkness, take me to light". This is the Sanskrit script in the lower left corner of the picture above. This is the tag line, the punch line of Husk Power Systems and very clearly signifies its motives. "We are world leaders in decentralised generation and distribution of electric power. Husk Power Systems (“HPS”) lighted the first village from its first 100% biomass based power plant that uses discarded rice husks to generate electricity in August 2007 and today it has installed 60 mini-power plants that power ~ 25,000 households in more than 250 villages and hamlets and impact lives of approximately 150,000 people in rural India." "What needed years was finding the right technology that fit the economic model for the rural space. A hunt that dedicated efforts from nanotechnology driven Polymer Solar Cells to the Jatropha based Biodiesel, and pretty much everything in between only led to realisations about how the different non-conventional technologies employing renewable resources lacked substance when it came to applying them to solve a broader problem." Evidently, it took some time to combine their good intentions with good business sense ie, using husk. Husk is a bi-product of rice milling and a low utility bi-product at that. If you don't know about paddy (the source of rice), it is composed of roughly 20% rice hull or husk, 11% bran and 69% starchy endosperm or rice. Rice is a stable food of Bihar and hence lot of husk is produced as bi-product. 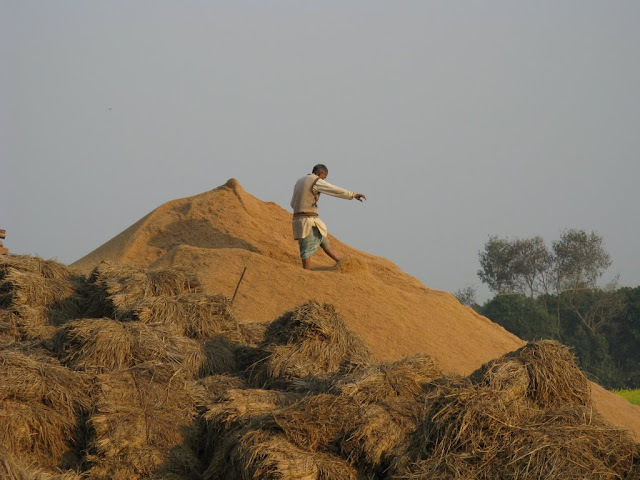 Lot of this husk is exported outside Bihar to be used in industrial boilers in other parts of the country. The husk doesn't has much local use except in the rice mills with boiling facilities. So, a lot of this husk is wasted (burnt off, left to rot producing methane). A planning commission study has estimated that about 200MW power could be generated using rice husk. So, the currently wasted bi-product of the staple food of Bihar translates into a local, carbon neutral, low cost fuel. This makes a lot of business sense. That was the fuel but what about the technology. In my view, another secret behind HPS's success is its focus on the bare essentials. The video below shows one of its plants and the distribution infrastructure. The plant is constructed of locally fabricated material and the distribution of electricity is carried out with the help of normal insulated wires and bamboo poles. A no frills operation. Even the boundary of the plant is constructed of the bamboo sticks. Is that enough safety? Will the equipment not be stolen or tempered? Probably not if what Manoj Sinha says is true. "The people feel like they own the plant---it's a serious community investment"
This statement definitely gives a sense of the close relation between the people and the technology in this project. The fast growth of the company and its wide acclaim is another evidence. The company has won several national and international awards for its innovations and efforts. It has also attracted investments from the Acumen fund and Shell foundation. The HPS projects mainly focus on providing lighting services in the villages although they also claim to provide electricity for commercial activities. It seems that light is something that several micro-generation projects focus on and something that is probably being seen as a global priority. However, I am not so sure if the same sentiments are reflected by the people on the ground. Do these people in the villages really priorities light over other electricity services or are their needs and priorities constrained due to lack of options? Is there a technical constraint in providing commercial services like irrigation as they need larger capacity generation systems? Is there a gap of perceptions, priorities and understanding? Having said that, the success of HPS surely signifies a success formula that possibly matches the ideas of peoples on the ground. However, further investigation may be required into this.